Wend is a world where the monsters and myths of our past have collided into a shared future. Ravaged by war, wizards, and the return of the gods, the earth needs heroes (and helpful villians) more than ever. 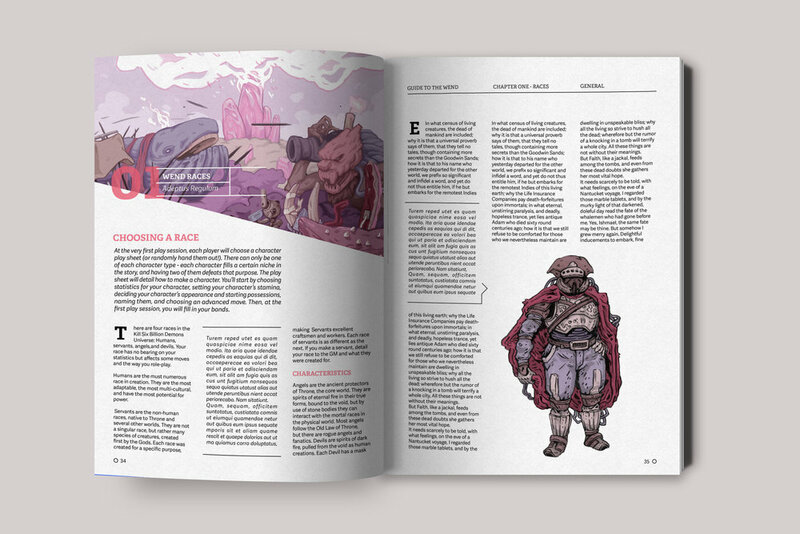 Loosely based on the Dungeons & Dragons D20 system, players take control of a character completely their own, with the help of the players handbook, a game master, and the adaptive Character Sheet webapp, to influence the world around them. Wend is a personal world I’ve developed over 3 years from it’s early stages as a comic book, then a lore world book, and now into the branding for a tabletop RPG. To represent the weird and winding world of Wend (Meaning: to go in a specified direction, typically slowly or by an indirect route) I chose a display typeface that looked kind of like a maze: Argon. Finding it too aggressively pointy, I curved off all the edges to give it an organic feel that fit better into Wend. D20 styled tabletop games are renowned for their usage of pen and paper to create and edit character and game statistics. This often limits players to the basic options the official paper allows, and makes stat changes time consuming. Wend instead as based around a web-app that works in full screen (to stop alt-tabbing as a distraction), that allows a player to store multiple characters and update their statistics and equipment easily. It also allows for an expanded inventory system, spell list, and in game whisper chat which allows players to hide secrets from other players or the GM for role-playing purposes.